I know it's football season now, but we just gotta talk about Braves' starter Kris Medlen here on An Opinion On Sports. Just think about these numbers: In nine starts he's he's 7-0 with an unconscious ERA of 0.86. He has 66 strikeouts to go with only eight walks in 62+ innings. Heavy stuff indeed. He seems to be the only Atlanta pitcher to realize the team is in a pennant race. The other starters, Hanson, Hudson, Maholm and Minor haven't stepped up their games in the stretch run to October. In the old Milwaukee Brave days it was "Spahn and Sain and pray for rain". Now I suppose we have to pray for four days of rain between every Medlen playoff start (yes, Atlanta will make the playoffs). He is the only starter the Braves can depend on. Tommy Hanson hasn't lived up to the hype. Tim Hudson is just plain overrated. Paul Maholm has been another trade disappointment. Mike Minor can find no consistency. 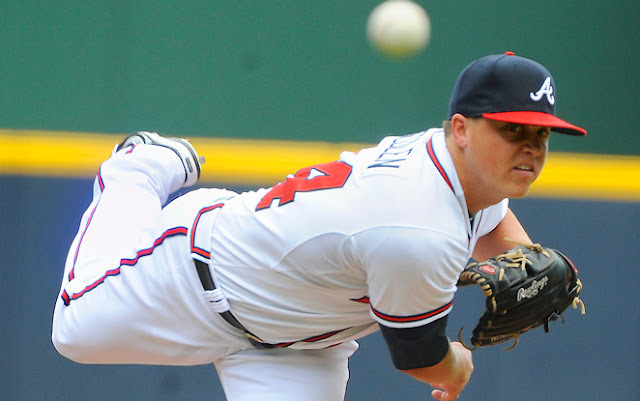 Kris Medlen is everything and more Atlanta could have hoped for. After all, he understands it's a pennant race.